James V had come to the throne as a boy as a direct result of his father being killed by the English at Flodden in 1513. His first years of office were under a Regent and Council, who held him as a minor under the tutelage of Angus and Douglas, which amounted to little more than imprisonment. His Guardians had ensured that his education was minimal, attempting to ensure that when he reached his majority he would still be dependant on them. After several attempts to escape the Guardians he at last succeeded in the summer of 1528 arriving disguised in Stirling. The Country rose in his support and after a brief campaign Douglas was defeated and Angus escaped to England. In 1529 James having set up his own Council in Edinburgh, was annoyed that the disorganised state of the Borders represented a weakness in the governance of his kingdom and avowed his intention to reduce them to order, no doubt remembering that Douglas originated in the Borders. Before this could be achieved he had to remove those powerful Border lords whose influence might thwart his plans, so he commanded the imprisonment of the Earl of Bothwell, Lord Home, Lord Maxwell, Scott of Buccleuch, Ker of Ferniehirst, and other powerful Border chiefs. It is unlikely that James a mere youth of seventeen without political education strategised a complex political plan to crush the nobility, it is more probable that he resented the outrages these men had committed against him during his minority and he was determined to remove this disrepectful band from his court and the public purse. In June 1529 he commanded the remaining Lords, Barons (and freebooters) to accompany him well-armed, with a months provisions and "doggis that were guid" to go hunting in Meggatdale and proceeded into Eskdale and Teviotdale with a force of 8,000 men to do justice on the Reivers. Indeed they did go hunting as the record notes that they took "eighteen score of deer" during their stay at St mary’s Loch. However James soon got down to real business of his Border Pacification: Cockburn of Henderson and Scott of Tushielaw, two notorious offenders were said to be hanged before the gates of their own castles (actually they were removed to Edinburgh and executed at the Tollgate), but the fate of Johnie Armstrong, of Gilnockie, near Langholm, produced a much deeper impression, although not unmingled with some commiseration, on the Reivers. Johnie was undisputed "King of the Borders" and it was said that "....from the Scottis bordour to Newcastell of England, thair was not ane of quhatsoevir estate bot payed [blakmeale] to this John Armestrange ane tribut to be frae of his cumber ....and albeit that he was ane lous leivand man, .....he was als guid ane chieftane as evir was upon the borderis...." James wrote "a lovyng letter in his ain hand sae tenderlie" inviting Johnie to hunt with him at Carlenrig, but Johnie and his men turned up to the meet so splendidly dressed and equipped that the young King took offence. The Balladist describes Johnie’s attire as having "a girdle embroidered and bespangled with gold and his hat with it’s nine targes each worth three hundred pounds; all that he needed to make him a king was the sword of honour and the crown" James was incensed and remarked "Quhat wantis yon knave thet a King shuld have" At first Johnie tried to talk his way out of trouble, offering half his "blakmeale" takings which were considerable as it was said that most of Northumberland paid "Blakmeale" to Johnie, but when he realised the futility of trying to bribe James, he then famously insulted the King, by saying proudly: "I am but a fool to seek grace at a graceless face! "; Johnie and his men were promptly "....all hangit apoun growand trees....". It is recorded that all Johnie’s estates were awarded to the imprisoned Lord Maxwell after this incident, rather suggesting that the whole thing had been a plot from the start, with Maxwell appearing to have nothing to do with it. 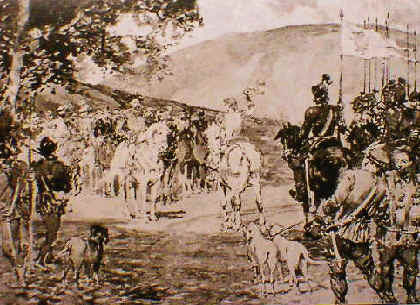 James V may have believed that his authority was well stamped on the Borders by this raid into the Reivers heartland, but he underestimated Johnie’s place in the scheme of the Borders: Johnie may have been one of the worst brigands to ride "....a heilk moon....", but he was an Armstrong which was one the largest and most powerful families on the Borders. Reivers could feud amongst themselves, even to the death, but they had a habit of allying together against outsiders. Maxwell was never forgiven by the Armstrongs and James had broken his "given" word to a Reiver. "Revenge is a meal best eaten cold" and the Reivers certainly waited for it to be well-cooled by the time their opportunity came around some 12 years later at Sollomoss. Maist beautiful it was to behold. And ilk ane worth three hundred pound. But the sword of honour and the Crown?" "Grant me my life, my liege, my King! Sall pay their yeirly rent to thee." "Away, Away, thou traitor strang! Out o’ my sight thou soon may’st be! And now I’ll not begin wi’ thee." But there is nane for my men and me. I should still have lived at Gilnockie. To ken you condemned me, this day, to dee." Thanks to James Bell for sending this in to us.